This name uses Eastern Slavic naming customs; the patronymic is Sergeyevichand the family name is Afinogenov. Maxim Sergeyevich Afinogenov (Макси́м Серге́евич Афиноге́нов, IPA: [mɐˈksʲim sʲɪrˈɡejɪvʲɪtɕ ɐfʲɪnɐˈɡʲɛnəf] ; born September 4, 1979) is a Russian professional ice hockey player currently playing for Dynamo Moscow of the Kontinental Hockey League (KHL). Known for his blistering skating speed,  he was drafted by the National Hockey League (NHL)'s Buffalo Sabres in the third round, 69th overall, in 1997 and played nine seasons with the club. He then played one season with the Atlanta Thrashers before signing with SKA St. Petersburg in 2010. MGO VFSO "Dynamo", commonly known as Dynamo Moscow is a Russian leading sports club based in Moscow. 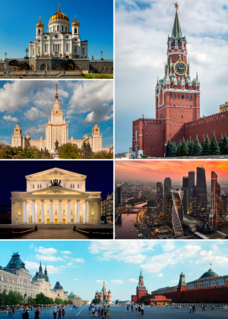 Founded by Felix Dzerzhinsky on 18 April 1923, Dynamo Moscow was the first institution created from the All-Union Dynamo Sports Club and the only one still connected to the old Dynamo society. The Kontinental Hockey League (KHL) is an international professional ice hockey league founded in 2008. It comprises 25 member clubs based in Belarus, China, Finland, Latvia, Kazakhstan, Russia, and Slovakia and it is planned to expand to more countries. It is widely considered to be the premier professional ice hockey league in Europe and Asia, and second in the world behind the National Hockey League. KHL has the third highest average attendance in Europe with 6,121 spectators per game in the regular season, and the highest total attendance in Europe with 5.32 million spectators in the regular season. Afinogenov was a forward for Dynamo Moscow of the Russian Superleague (RSL) for four seasons. He was drafted 69th overall by the Buffalo Sabres in the 1997 NHL Entry Draft and played his rookie NHL season in 1999–2000, scoring 34 points in 65 games, while also playing in 15 games with the Sabres' American Hockey League (AHL) affiliate, the Rochester Americans. Following his third season with the Sabres, a 21-goal, 40-point campaign in 2001–02, Afinogenov re-signed with a two-year, $2.4 million contract on September 4, 2002. However, that same day, while playing a pickup game in Moscow, he took a puck to the head, suffering a concussion. He was limited to just 35 games in the subsequent season, managing just 11 points. The next season, in 2003–04, he recorded his first career hat-trick on December 31, 2003, at HSBC Arena in a 7–1 win against the Washington Capitals. He finished the season bouncing back from his previous concussion-riddled season with 17 goals and 31 points. HC Dynamo Moscow is a Russian professional ice hockey club based in Moscow. It is a member of the Bobrov Division in the Kontinental Hockey League. The Russian Superleague, commonly abbreviated as RSL, was the highest division of the main professional ice hockey league in Russia. It was considered the second best league in the world, after the National Hockey League (NHL) of North America. It was a part of the Russian Pro Hockey League which was composed of three divisions — the Superleague, Major League, and First League. Afinogenov during a game in 2006. After spending the 2004–05 season back in Russia with Dynamo Moscow due to the NHL lockout, Afinogenov recorded his best season to date when NHL play resumed in 2005–06 with personal bests of 51 assists and 73 points. As the Sabres embarked on a playoff run to the Conference Finals, where they were defeated in seven games by the eventual Stanley Cup champion Carolina Hurricanes. Afinogenov added eight points in 18 post-season games. He continued his scoring pace the following season in 2006–07 and, despite missing 26 games, scored 61 points and a career-high 23 goals. During the season, Sabres backup goalie Martin Biron was traded to the Philadelphia Flyers at the trade deadline in February 2007, making Afinogenov the longest-serving Sabre on the roster. His production tailed off in 2007–08, however, managing just 28 points in the same number of games as the previous season. Following the 2008–09 season, in which he was sidelined once more with a groin injury,  Afinogenov became an unrestricted free agent and was not re-signed by the Sabres. He left the club as the longest-serving Sabre on the previous season's roster, having played for the club since his rookie season in 1999–2000. 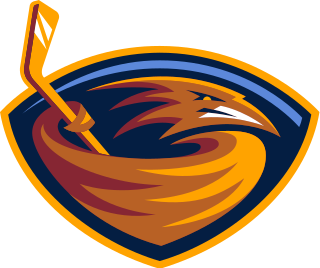 On September 17, 2009, the Atlanta Thrashers invited Afinogenov to their 2009–10 training camp on a tryout. and on September 29, 2009, he signed a one-year contract with the team worth $800,000. He scored his first goal as a Thrasher on October 17, 2009, against the Buffalo Sabres. He finished the season with a career-high 24 goals and 61 points, finishing second on the team in points, behind only Nik Antropov. The 2008–09 NHL season was the 92nd season of operation of the National Hockey League (NHL). It was the first season since prior to the 2004–05 lockout in which every team played each other at least once during the season, following three seasons where teams only played against two divisions in the other conference. It began on October 4, with the regular season ending on April 12. The Stanley Cup playoffs ended on June 12, with the Pittsburgh Penguins taking the championship. The Montreal Canadiens hosted the 57th NHL All-Star Game at the Bell Centre on January 25, 2009, as part of the Canadiens' 100th season celebration. Miroslav Šatan is a Slovak former professional ice hockey right winger who most recently played for Slovan Bratislava of the Kontinental Hockey League (KHL). Anton Anatoliiovych Babchuk is a Ukrainian-Russian former professional ice hockey defenceman He last played for Atlant Moscow Oblast of the Kontinental Hockey League (KHL). Andrei Yurievich Zyuzin is a Russian former professional ice hockey player who last played for Bilyi Bars of the Ukrainian Hockey Championship and HK Vitebsk of the Belarusian Extraliga (BXL). He also played for six different teams during his time in the National Hockey League (NHL). Robert B. Schremp is a former American professional ice hockey center. He was drafted by the Edmonton Oilers in the first round, 25th overall, of the 2004 NHL Entry Draft and has played for the Oilers, New York Islanders and Atlanta Thrashers in the NHL. Robert Sanguinetti is an American professional ice hockey defenseman who is currently playing with the Charlotte Checkers in the American Hockey League (AHL). He previously played within the New York Rangers, Carolina Hurricanes, Buffalo Sabres and Vancouver Canucks organizations in the National Hockey League (NHL). He was originally drafted 21st overall by the New York Rangers in the 2006 NHL Entry Draft. Sergei Sergeyevich Shirokov is a Russian professional ice hockey winger currently with Avangard Omsk of the Kontinental Hockey League (KHL). Prior to signing with Vancouver in 2009, Shirokov played with CSKA Moscow for four seasons in the Russian Superleague and Kontinental Hockey League. He returned to CSKA Moscow in 2011 after two years with the Vancouver Canucks and Manitoba Moose. Alexander Ivanovich Korolyuk is a Russian former professional ice hockey winger who played in the National Hockey League (NHL) with the San Jose Sharks before playing the remainder of his career in the Kontinental Hockey League (KHL). Benjamin Jeffrey Maxwell is a Canadian professional ice hockey centre currently with HC Spartak Moscow of the Kontinental Hockey League (KHL). Denis Andreevich Tolpeko is a Russian professional ice hockey centre who is currently an unrestricted free agent. He most recently played for HC Spartak Moscow of the Kontinental Hockey League (KHL). André Benoit is a Canadian professional ice hockey defenseman who is currently an unrestricted free agent. He most recently played for the Bridgeport Sound Tigers in the American Hockey League (AHL) while under contract to the Columbus Blue Jackets of the National Hockey League (NHL). He has previously played for several other professional teams including the Ottawa Senators, Colorado Avalanche, Buffalo Sabres and the St. Louis Blues of the NHL, Södertälje SK, Tappara and Malmö Redhawks in Europe, as well as Spartak Moscow of the KHL. Paul Szczechura is a Canadian professional ice hockey player. He is currently playing with Traktor Chelyabinsk of the Kontinental Hockey League (KHL). Jason Akeson is a Canadian professional ice hockey right winger for Kölner Haie of the Deutsche Eishockey Liga (DEL). He has previously played in the National Hockey League (NHL) for the Philadelphia Flyers. Alexander Igorevich Khokhlachev is a Russian professional ice hockey forward who is currently playing for HC Spartak Moscow in the Kontinental Hockey League (KHL). He was selected by the Boston Bruins, 40th overall, in the 2011 NHL Entry Draft. Miro Aaltonen is a Finnish professional ice hockey forward. He is currently playing with HC Vityaz of the Kontinental Hockey League (KHL). Aaltonen was selected by Atlant Moscow Oblast in the 2nd round of the 2011 KHL Junior Draft, and he was also selected by the Anaheim Ducks in the 6th round of the 2013 NHL Entry Draft. Eric O'Dell is a Canadian professional ice hockey player. He is currently playing with the HC Sochi of the Kontinental Hockey League (KHL). O'Dell was originally selected by the Anaheim Ducks in the second round of the 2008 NHL Entry Draft and has played in the National Hockey League with the Winnipeg Jets. Nikita Sergeevich Zadorov is a Russian professional ice hockey defenceman currently playing for the Colorado Avalanche of the National Hockey League (NHL). He was originally drafted by the Buffalo Sabres in the first round, 16th overall, in the 2013 NHL Entry Draft. Roman Lyubimov is a Russian professional ice hockey player who is currently under contract to Metallurg Magnitogorsk of the Kontinental Hockey League (KHL). 1 2 3 "25 – Buffalo Sabres". Sports Illustrated . 2005-10-03. Retrieved 2009-04-01. ↑ "Afinogenov Q&A". NHL.com. Archived from the original on January 9, 2010. ↑ Андрей Дедов. (July 17, 2011). "Чемпион мира и героиня Олимпиады женились на крыше". Life News Online . Retrieved 2011-07-17. ↑ "Max Pacioretty Wedding Photos". yourcanadiens.com. 2011-07-02. Retrieved 2011-07-02. ↑ "Rare double hat trick pace Sabres". CBC. 2004-01-01. Retrieved 2009-04-01. 1 2 "Free agent Maxim Afinogenov could find new home with Atlanta Thrashers". ESPN. 2009-09-18. Retrieved 2009-09-18. ↑ "Afinogneov, Rybin and Iggulden joins Vityaz". kenros.com. 2013-08-02. Retrieved 2014-01-02.